Weather forecast: It is expected to be the warmest part of the day with temps in the low to mid-50s. It should be a great environment to drop some great times and performances. The battle for the team trophies is so tight this year. 2018 has been filled with breakout and emerging teams that will battle for a team trophy this year and for years to come. Wheaton-Warrenville South came into the season the favorite to win the title back and August and have been the favorite every moment since. They are undefeated this year as a team getting wins at some of the top meets in the state, some were close and some were blowouts. This past weekend the Tigers didn't look like they have all season long. Was this formable group in state dress rehearsal mode at the Niles West Sectional? Two key runners for them in senior Sean Maison and junior David Zeller were their sixth and seventh runners. Senior Sean Maison has been a sub 15:00 runner most of the year for the Tigers but was not at his best there. Zeller is coming back after missing the previous two weeks of running due to an illness, the Tigers better hope he knocked off the rust and is ready for the state meet. If Zeller cannot throw down like his usual self it is not the end of the world. Look for juniors Jared Peaslee or Ethan Seng could step up for them and be in that number five role. For the Tigers to guarantee themselves a state title they will need junior William Hauenstein in the top 10, the Maison twins in the top 20, and junior Jacob Kluckhohn in the top 30, and whoever their fifth runner is in the top 60. Hersey is a very interesting team entering the state meet. They may be the only team in the state that can match up against Wheaton-Warrenville South through three runners and even get fewer points with junior Josh Methner almost guaranteed to finish higher than Hauenstein. The Huskies are the team with probability the best momentum entering the state meet. They have won their last four meets including a huge win at the Palatine Meet Of Champions Invite. The Huskies and Tigers have gone head to head only one time this year and it was at the Peoria Richard Spring Invite where the Tigers easily got by the Huskies team. They have grown tremendously since and may give the Tigers a run for their money that most will not expect. To test the Tigers, they will need Methner to win, junior Max Svienty and senior Ryan Buch in the top 20, and senior Thomas McCarthy and junior Colin Safford to be in the top 60. Downers Grove South is a very sneaky team that may be able to squeeze their name into a team trophy position. The Mustangs have been very inconsistent as well this year, but when they are on it, they are difficult to beat. They will need a performance like they had at the Peoria High Invite when they upset Lyons Township to win the team title. The team's chances depend on how their number one runner senior Eddie Siuda performs. To get a team trophy the Mustangs will need Siuda to be top 20, John Norris and John Heneghan need to be in the top 40, then James Weigel and George Willer in the top 70. 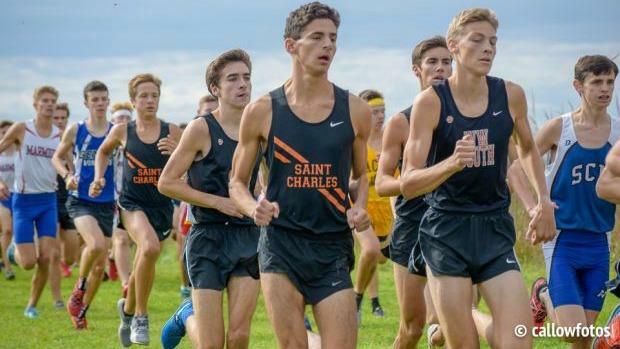 St. Charles East is an emerging team who is a favorite to take home a team trophy this Saturday. The Saints didn't have the performance that many expected them to have at the Waubonsie Valley Sectional. They still ended up winning over Neuqua Valley, but it a closer battle than expected as they only won by 23 points. They can be so much better than that performance as they had their normal number two and number three runners, Aidan King and Bennett Melone. The Saints will need those two to perform like they have the rest of this season if the Saints want to assure themselves a team trophy. They need Bob Liking in the top 15, King and Melone in the top 30, Micah Wilson in the top 50, and Zack Loomis in the top 80. Neuqua Valley enters this year's edition of the state meet for the first time in a few years not being a favorite to win a team trophy. History has shown us that we can never count out the Wildcats, especially with the way their team is made up currently. They have six seniors in their top seven, that means that they really have nothing to lose. Don't be surprised if Wildcats try and go for the win as they will go out and try to do something crazy. To be at least in the to80p three teams they will need Michael Madiol and Chris Keeley in the top 25, Nicholas Dovalovsky and Michael O'Connor in the top 60, and Matt Jett in the top 75. The Hilltoppers have had a very up and down season. To start off the year they were waiting for preseason projected number two runner, Stephen Moody, to finally perform they way they thought he would. They waited until the Naperville Twilight Invite when Moody took second place to teammate Rory Cavan who at that point was arguably the best runner in the state. Sadly shortly after that point, Cavan started to not look like himself. He had some not so great performances at conference, regionals, and sectionals. If the Hilltoppers want to collect a team trophy they will need both runners on the top of their game and in the top 10, Will O'Brien in the top 60, and Ian Repking and William Hohe in the top 80. York has been a pleasant surprise this year after coming into the season looking lean as they have in over 50 years. The thing about this team is that they a legitimate threat to be a team trophy winner this year and they don't have a single senior on their top seven. It is very rare to see a team this good be all returning the following year. To get a state trophy this year they will need Ethan Kern in the top five, Daniel Klysh in the top 15, Colin Hill in the top 30, then Michael Moriarty and Sam Ayers in the top 80. Coming into this year we knew we wouldn't have the same star power we had last year with Dylan Jacobs, Danny Kilrea, and Clayton Mendez, but it hasn't been terrible. The competitors in the land of Lincoln have really stepped up this year and has made the argument of "who will win state?" a fun one. The most consistent athlete in the field has to be Josh Methner. He is on a roll as he only has one loss on the year and it is to Rory Cavan when he was the best runner in the state. Besides for Cavan, Methner has wins over some of the favorites to win the individual title. His best performance this year has to be his course record performance at the Palatine Meet Of Champions Invite. He ran a 14:32.20 to set a new meet and course record besting the performance of Jack Driggs of York who ran 14:33.00 back in 2010 on the Deer Grove East course. His recent performances have indicated that Methner coasted through his conference, regional, and sectional and is preparing to give an amazing performance at the state meet. Thomas Shilgalis of Maine South has had a season of peaks and valleys. He came into the year one of the favorites to win the state meet and while he still is a favorite it seems less likely than a few months ago. Perhaps the leading cause of Shilgalis's lack of consistent success may be due to the Detweiller At Dark Curse. The curse is basically if you win Detweiller At Dark, something bad will happen to you later in the season. It is crazy when you look at the past winner's success in the postseason. But in all seriousness, if Shilgalis is completely on his game, he will be hard to beat. 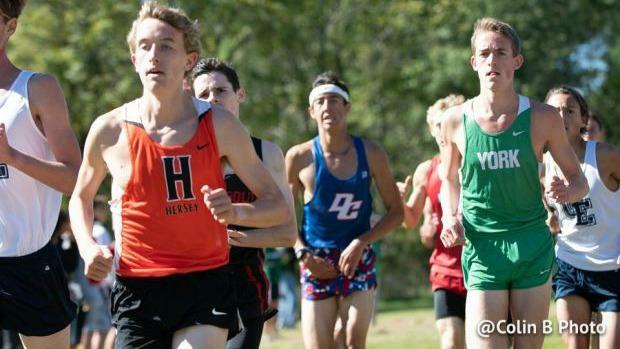 Tommy Brady of Park Ridge Maine South came into the season as our nationals teams favored to win the state meet as he was ranked 18th in the Milesplit Flo50 polls. Since he has had a rough season as he has come up a little short at each of his big meets this season. At the First To The Finish invite he had trouble finishing the race due to illness, at Palatine Meet Of Champions he got easily defeated by Methner by about 10 seconds, at the Peoria High Invite he lost by 10 seconds to Shilgalis, and the Niles West Sectional he took second in a close battle with Ethan Kern. Of the eight races that Brady has been part of this season, he has only won two of those. It could be possible he has been saving himself for something big at the state and his track record has shown we can't count him out as he is the top returner from last years state meet. Rory Cavan started his season off stronger than anyone else. He went undefeated all the way up until the West Suburban Conference (Silver Division) when he took sixth place. We have been hearing that he is sick lately and that is the reason behind his recent performances, but another possibility could be him just playing with us and trying to stay under the radar for the state meet. Ethan Kern of Elmhurst York has to be the breakout athlete of the year. The youngest Kern boy, came into high school with loads of hype carrying the Kern name people automatically expected Charlie Jr. and Charlie Sr. type of performance, but no offense to Ethan, he didn't have those performances until this year. A major cause may be a rough start to his sophomore campaign due to injury and missing all of his sophomore outdoor track season due to injury. Now that he is healthy he has performed great especially at his conference and sectional meets as he won against some of the top competition in the state. Kern will for sure be top four and has a good chance at possibly winning the whole thing.